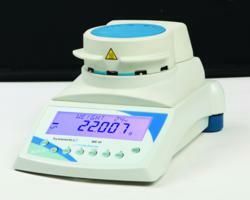 Fast, simple, and dependable—ideal for basic moisture determination. Moisture determination ensures a consistently uniform product through each stage of production. For speed of response and ease of use, the Symmetry® MB Moisture Determination Balances from Cole-Parmer are an efficient new option for incoming inspection and receiving, quality control, and production. The Symmetry MB Moisture Determination Balances feature an automatic test setting to run multiple tests quickly. An internal memory bank stores a range of test procedures that can be recalled at the touch of a button. The balance delivers results in grams, % moisture, % solids, % moisture vs dry weight, and % solid vs dry weight. Its large, brilliant display shows temperature, time, and moisture simultaneously. The multi-language unit displays and prints in English, German, French, and Spanish. A single 400 W halogen heater controls temperatures from 50 to 160°C. Overload protection prevents damage to internal weighing components and offers continued performance and long-term usability. To keep the balance secure from theft, it includes a locking slot for a Kensington™ type lock and cable. Choose from 115 or 220 V models. For more information, call 800-323-4340 or visit ColeParmer.com/19271.